Home video recording studio setup. Girl having fun in front of digital camera while shooting a video blog. 4k00:23Home video recording studio setup. Girl having fun in front of digital camera while shooting a video blog. 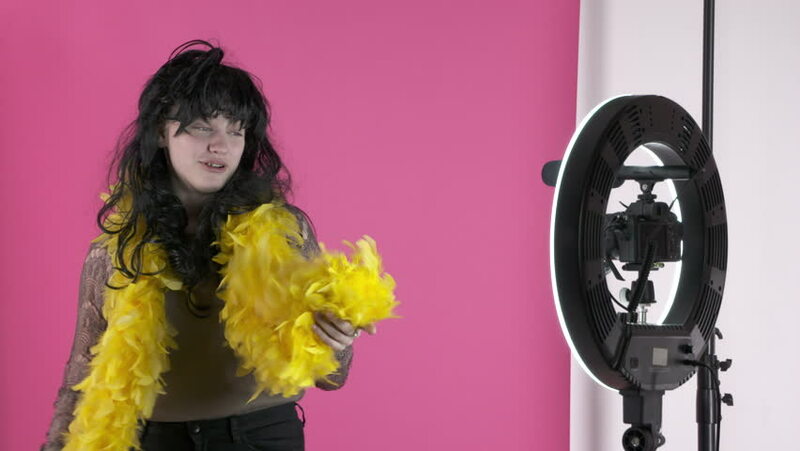 hd00:23Teenager in wig and feather boa having fun while shooting a video blog. Young girl vlogger recording new video for vlog in front of camera. Bright colors and positive emotions in slow motion. 4k00:104K Girl Suddocates in color smoke happy backstage parody footage for different projects. Slow motion 150fps. hd00:06Young handsome white guy lets rings out of steam. Vaping.